EVO MORALES AYMA, President of Bolivia, recalling earlier statements by some Heads of State today, said he realized that there were “enormous differences” between small countries and major Powers; between those who valued the “culture of life” and others who valued the “culture of death”. While everyone had the right to hold differences, the United Nations was obliged to help align Governments in order to guarantee the equality of all peoples. With 1 per cent of the world’s population holding 50 per cent of its wealth, the problem of poverty would not be solved, he stressed. Imperialism sought to control oil resources, while drug trafficking and terrorism were used as excuses for foreign intervention. What use, then, was the United Nations when a small group of countries decided on interventions? he asked. “It’s a Security Council for whom? It’s the insecurity council for the Presidents of people who seek cultural and social liberation and recovery of their economic resources.” He called for a “re-founding” of the world body because it was time that its resolutions, especially those on the Cuba embargo, were respected. Expressing his country’s recognition of Palestine, he welcomed it to the United Nations, while recalling that there had been a coup d’état in Honduras and killings in Palestine, but the North Atlantic Treaty Organization (NATO) and the Security Council were nowhere to be found. Against that backdrop, he reflected on how Governments could free their countries, saying that natural resources could never be privatized or handed over to transnational companies. Recalling that Bolivia had nationalized its resources in 2006, he said that from that moment on, it had stopped being a “beggar State”. Investment in the country before 2006 had stood at $600 million, but today it had reached $3.6 billion, he said. He also stressed that basic services like water, energy and electricity could never be private services, and that the State must be responsible for public utilities. Water was a human right, he added. Discussing the struggle for human dignity and national sovereignty, he recalled that before his presidency, Bolivia had hosted a United States military base and the Chimore Airport could not be used without permission from that country’s embassy. On assuming office he had closed that base and now wished to develop proposals for the United Nations so that it could restore dignity to all peoples. Turning to the question of international financial institutions, he said the International Monetary Fund (IMF) had shut off Bolivia’s access to international credit, placed conditions on loans and privatized its refineries. Instead, credits had been provided to transnational companies. Calling for the creation of alternative financial bodies, he pointed out that the Bank of the South did not make money off the backs of the Bolivian people. On other matters, he said Bolivia had appealed to the International Court of Justice for help in settling a dispute with Chile over access to the Pacific Ocean, which should not be considered an “unfriendly” act. Bolivia’s landlocked status was the product of a war and it was seeking reparations of an injustice, he said, noting that the treaty of 1954 between the two nations had led to neither peace nor friendship. 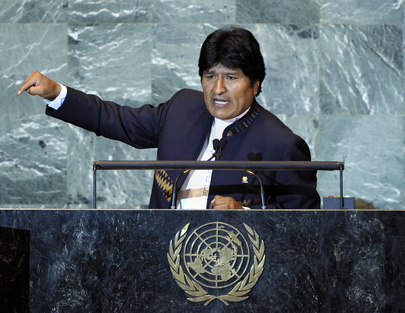 Rather, it meant that Bolivia lacked access to a port, he said, requesting United Nations support. On the fight against drug trafficking, he said the United States Drug Enforcement Agency in Bolivia was controlling the trade. Drug traffickers used banks to launder their money, which meant bank confidentiality must stop, he added. With respect to the food crisis, he said new ways were needed to encourage production through fair trade, emphasizing that naked competition would never solve the problem of poverty. Finally, he said the “crisis of capitalism” was a “bottomless hole” and that imperialist countries sought any pretext for invasion. Just this morning, the President of the United States had said that Iraq was free and that Iraqis could govern themselves, he recalled, wondering who was in charge of oil reserves in that country and in Libya, where bombings were taking place so that the United States could get its hands on the country’s oil. With that, he called for a new “10 commandments” of social demands for basic services, natural resources, dignity and sovereignty.